The Tiara 4300 Sovran was a game changer in the boating industry, the first American boat to be designed exclusively for Volvo’s then new and soon to be revolutionary IPS drive system. The Sovran’s luxurious interior, an appealing blend of high-gloss cherry cabinetry, ultra leather upholstery and hardwood flooring makes it one appealing yacht. 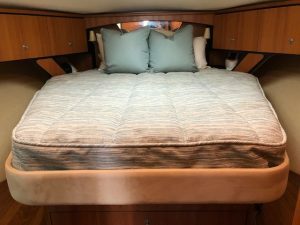 A good night sleep on such a luxury boat is a must and that’s where our latex mattresses come in. We did our custom 7” latex mattress for the master stateroom. Constructed with a 6″ Latex core and covered in an ultra-soft bamboo quilting, our 7” Commodore mattress is one of our most popular style. The benefits of a latex mattress include being mold and mildew resistant, extremely comfortable, latex helps regulate body heat, which allows you to sleep cooler and it is bendable and breathable. Available in Soft, Medium Firm and Firm. 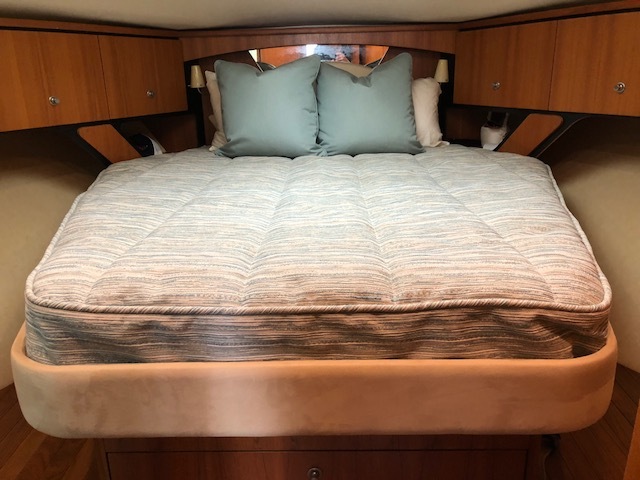 The good thing about our mattresses is that each boat mattress is crafted to fit the unique size and shape of your berth. Each boat mattress we make is crafted custom in California and built to stand up to rigors of a marine environment. We have two other styles when it comes to our latex mattresses. Our 9” Admiral is for our clients who love a plush mattress. It is constructed with a super comfy 6” (medium) Latex core. We then add 2” of ultra-soft latex Pillow Top and cover it in the plushest of bamboo quilting. The result is a 5-star hotel mattress! Last, but not the least, is our 6” Hybrid mattress constructed with a 3” base of hi density polyurethane foam and 2 inches of soft latex and covered in our plush bamboo quilting. Our Hybrid mattress is an economical way to enjoy the comfort of Latex and freshen up your stateroom and works great for bunk beds and crew quarters. 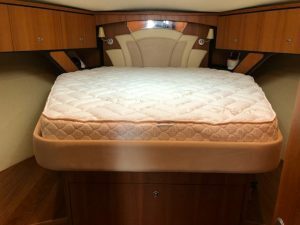 With several boat mattress and mattress topper options to choose from, we are able to create a sleeping solution to fit all budgets. All you do is contact us and will guide you what would work best for your boat. We also did sheets throughout and coverlets for this client. We used our Geyser fabric for the coverlet for the master stateroom. My personal favorite because of its cool color and texture. The Sunbrella Euro pillows in solid works as great accent! Staying in the same color family, we used Sunbrella Sky for coverlets on the guest beds. 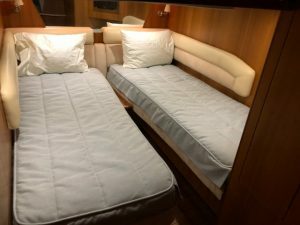 At Yachtbedding.com, our promise to our customers is to have a great night sleep on their boat with extra comfort and off course, in style.